Relentless power and tough durability are standards for modern pickup trucks. 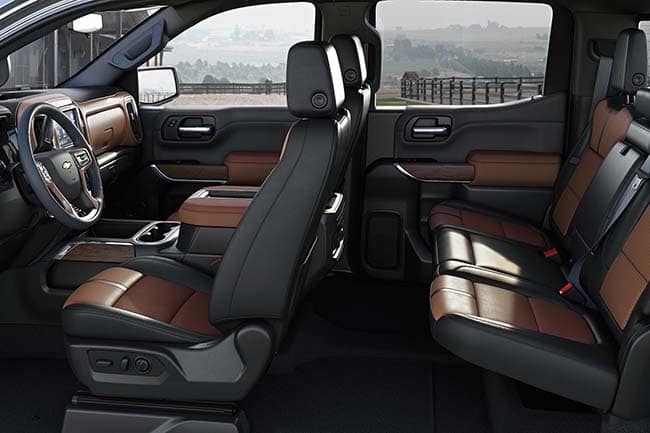 However, the all-new Chevy Silverado 1500 and 2019 Ram 1500 add thoughtfully appointed comforts to ease your hard day’s work. Our experts at Mike Anderson Chevrolet of Merrillville near Gary, IN, compiled the necessary information to make your full-size pickup decision easy. Check out our 2019 Silverado 1500 inventory to find the trim that fits your lifestyle. You can also visit our model research hub to learn more about the Chevy Silverado 1500. Please direct all questions regarding new Chevy Silverado 1500 and Ram 1500 differences to a Mike Anderson Chevrolet representative by calling (219) 947-4151 or fill out our online form. For the purposes of this comparison, we’ll be looking at the 2019 Chevy Silverado 1500 LTZ, starting at $44,495 MSRP, and the 2019 Ram 1500 Laramie, starting at $39,895 MSRP. Proven performance is essential when it comes to a working truck. Rest assured, you can rely on the new Chevy Silverado 1500 and RAM 1500 to accomplish your hefty to-do list. These powerful, light duty trucks are capable enough to handle whatever your jobsite or daily commute can throw at them. However, the 2019 Chevy Silverado offers considerably more torque and towing capacity. View standard engine specifications for the all-new Chevy 1500 and RAM 1500 in the table below. After a long day, nothing beats retreating to the quiet, refined interior of your premium full-size truck. 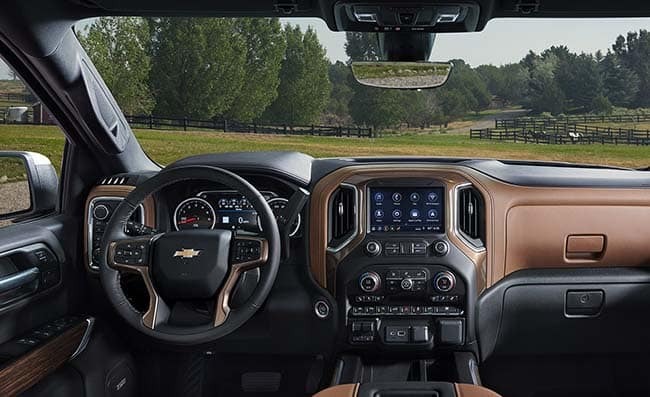 Both the 2019 Chevy Silverado and Ram 1500 offer soothing amenities, such as a heated steering wheel, to ease away the day’s tensions. Explore premium interior comforts only available with the all-new Chevy Silverado 1500 below. 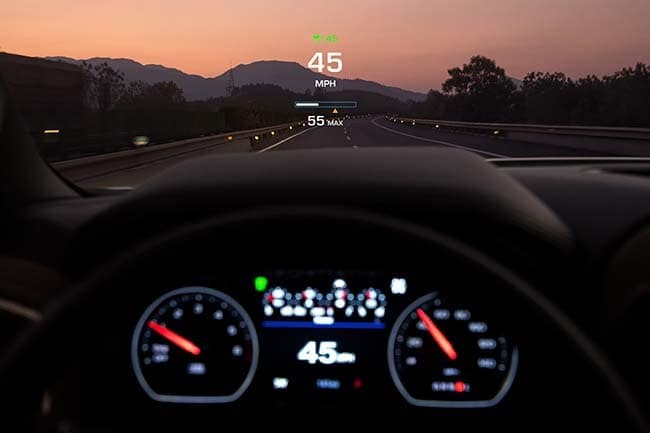 With ever-changing road conditions, you need to stay connected and charged-up to tackle the unexpected. The all-new Chevy Silverado 1500 and Ram 1500 contain numerous technology features, like charging USB ports, to keep you connected on the go. View a sampling of the high-tech features on the 2019 Chevy Silverado 1500 below. Protect what matters most every time you drive the 2019 Chevy Silverado 1500 and Ram 1500. These reliable trucks offer a comprehensive suite of safety features sure to keep you and your passengers safe on every terrain. Browse advanced safety features available on the new Chevy Silverado 1500 below. Go boldly with the 2019 Chevy Silverado 1500. To experience this capable, full-sized pickup truck for yourself, view the all-new Chevy Silverado 1500 inventory at Mike Anderson Chevrolet of Merrillville near Gary, IN, to find the trim for you. Then, schedule a test drive and we’ll get you behind the wheel of your favorite Silverado 1500 model! To learn more about the Chevy Silverado 1500 versus RAM 1500, contact a Mike Anderson Chevrolet product specialist by calling (219) 947-4151 or fill out our online form.